Thirsty and worrying work this Court of Appeal stuff. A couple of beers in the Back Bencher at the end of a two day hearing in front of Justice Rhys Harrison, Justice Mark Cooper, and Justice Forrest Miller. Bruce Rogan (Chair of Mangawhai Ratepayers and Residents Association) and his wife Heather flank the MRRA legal team - Matthew Palmer QC on the left, and Kitt Littlejohn Barrister on the right. (The hearing was on the 25th and 26th of August 2015). that the Kaipara District Council (KDC) does not have the power to rate for unlawful purposes. That KDC acted unlawfully in deciding to enter into and expand the Ecocare Wastewater Scheme, and that it could not then enforce rates on ratepayers. that the Validation Act did not retrospectively validate ALL matters stemming from those unlawful decisions. It only validated various historic rating defects. Significant matters - including the additional $30,000,000 loan were not dealt with or validated by the Validation Act. that the KDC acted inconsistently with the Bill of Rights Act by initiating Validation Legislation which had an effect of undermining MRRA judicial review proceedings - to which they had a right. The CoA decision will take a while. A few months. Hard to usefully summarise such a packed and interactive two days - the justices stopped the QC's for Kaipara District Council (David Goddard QC) and Matthew Palmer frequently. Questions of clarification, information, tangential thoughts. Very interesting. One of the strands of the hearing was the matter of consequences. What would happen if the CoA made certain orders? Would it mean the cost of the Ecocare sewerage scheme being carried by all of Kaipara District's ratepayers? Among Matthew's closing remarks - his reply (which is apparently quite restricted in what it can/cannot address), he told the Justices, to the effect: "a consequence of adopting the arguments of my learned friend would mean that any Council in New Zealand can breech Local Government Act provisions with impunity, leave ratepayers with the bill, and mean that Long Term Plans all become window-dressing, ratepayer submissions become meaningless. That cannot have been what Parliament intended." You could have heard a pin drop at that moment. Certainly the twenty or so Mangawhai residents in the Wellington courtroom had to restrain themselves from shouting: "hear, hear", while those 30 or 40 residents who took a bus down to attend the hearing by videolink in the Court of Appeal hearing room in Auckland's Queen Street, probably didn't have to restrain themselves. Make no mistake, these are heavy duty matters. 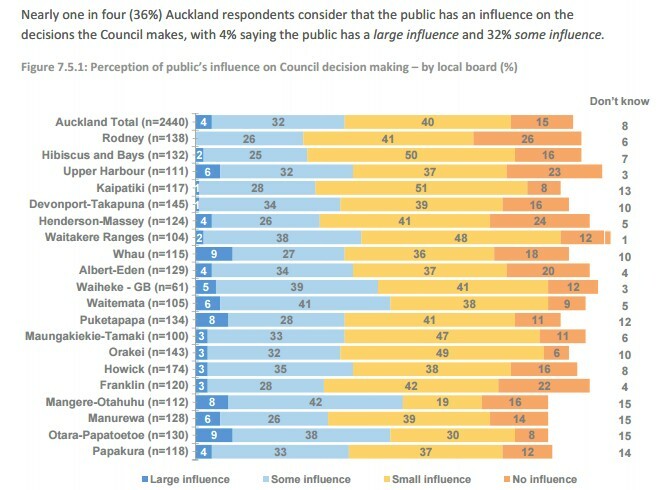 Matters of local government principle that have not been clarified by New Zealand courts to date. With any luck important principles will be established through the Court of Appeal judgment. In this group pic you can see Auckland mayoral candidate Penny Bright. She can sniff out a hot issue at a 1000 metres. The professional legal team. In fact, the same team supported Urban Auckland in its fight with Ports of Auckland Ltd and Auckland Council over the Bledisloe Wharf extensions. Matthew has built something of a reputation working with issues that interact with the New Zealand Bill of Rights Act (BORA). (Enacted in 1990 - 25 years ago.). He argued that Kaipara District Council acted inconsistently with BORA because it initiated Validation Legislation in Parliament, which, according to Justice Heath who heard the original judicial review proceedings, effectively stymied MRRA attenmpts to get the issues dealt with by the High Court. One of the rights that is recognised in the NZ Bill of Rights Act is the right to a judicial review hearing which can hold public institutions to account. Palmer argued that in initiating and pursuing the Validation Act, to retrospectively validate unlawful prior decisions, the ratepayers were denied that right. He argued that KDC had acted inconsistently with the Bill of Rights. We await the decision with great expectations and interest. The Quality of Life Project was initiated in 1999 in response to growing pressures on urban communities, concern about the impacts of urbanisation and the effects of this on the well being of residents. The project was a collaboration between councils represented in Local Government New Zealand’s Local Government Metro Sector forum. The key purpose of the project was to provide information to decision-makers to improve the quality of life in major New Zealand urban areas. Quality of Life reports have been prepared periodically, and these are based on Quality of Life surveys. Quality of Life Surveys have been carried out for the years: 2003, 2004, 2006, 2008, 2010, 2012 and 2014. Prior to 2014 the last full Quality of Life report was prepared in 2007. The Quality of Life website explains: "Following several significant events in New Zealand, including the devastating Canterbury earthquakes, the subsequent postponement of the 2011 Census of Population and Dwellings to 2013, the amalgamation of local government in the Auckland region in 2010, and a general tightening of local government funds, a decision was made to disband the wider Project......"
However, as the Quality of Life website notes: "....it was agreed by the core participating councils of Auckland, Wellington, Christchurch and Dunedin to continue in a collaborative partnership with the 2014 Survey....". I looked at that survey when I prepared the recent blog posting which considered the relationship between urban growth and urban quality of life. 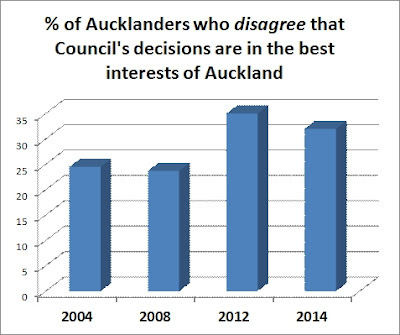 There are other measures of what is happening in Auckland to the quality of life that need to be given more attention by Auckland Council and by third sector organisations with an interest in protecting quality of life from policies and strategies which emphasise growth at the expense of quality of life. Thank you Wellington for a memorable evening. And I only got to see a little bit of it. Does High Growth = High Quality of Life? A range of policy measures have been put in place by Central Government to encourage and enable urban development across Auckland. These include the supercity amalgamation project which had very little to do with economic efficiency, and much more to do with creating a form of local government much more under the control of Central Government than the city councils it replaced, and much less directly accountable to local ratepayers. Central Government has been able to influence the policy settings of Auckland Council by requiring a particular form of Auckland Plan (defined in legislation), and by requiring Auckland Council's transport planning - for example - and budgeting to accord with Central Government policies on which modes should receive greatest priority (roads for cars rather than public transport). 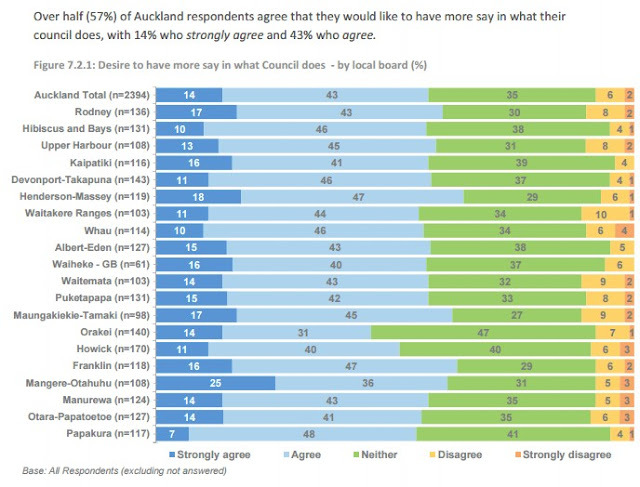 The issue of housing affordability and housing supply is where the influence of Central Government's focus on economic growth - at pretty much any cost - is driving Auckland Council policy settings, with little regard for how those policies will affect the quality of life of people, families and communities already resident in Auckland. 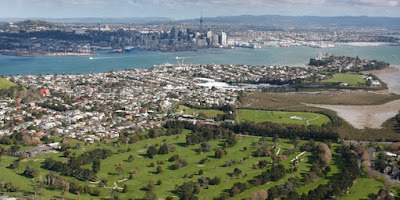 Put simply, Central Government policy is to free up urban development and redevelopment opportunities in Auckland (remove "red tape" and minimise the influence of "nimbyism" both derogatory terms used to describe processes where existing communities can protect their quality of life from the effects of development), to increase demand pressures for housing (by increasing immigration targets) and at the same time to ensure that property investment is largely de-regulated. It is a classic neoliberal strategy to unleash market forces in Auckland property and land development. Various stakeholders will gain from these policies. The building industry is booming and already stretched to meet demand because of a shortage of skilled tradesmen. The finance industry has an area of the economy it can direct investment with little risk - it seems. Central Government coffers gain from the GST and taxes from increased economic activity, and there's foreign capital from foreign investment in building and brought into the country by new immigrants. These are all gains. But there are losers in this strategy. These include those existing residents who might lose a golf course, who might suddenly find a piece of park or stopped road has been sold by Council to a developer, who find they can't get their kids into a school with reasonable teacher ratios because places have been taken up by new families in a new subdivision, by workers who find they can no longer reliably get to work in a half hour because new residents have filled up the roading networks. The list is lengthening. Their ability to resist the impacts of this growth strategy on their quality of life has been steadily reduced to the point they can almost be ignored. For now. There are other signs of a shift that is being forced on the City of Sails. We read in NZ Herald today that more luxury shops are moving into Queen Street and the CBD. Those who regularly walk Queen Street know how few people visit these high end shops, but I understand from retailer friends that it takes just a few very high value transactions each week to keep them viable. But the streetscape that results is not for the rest of Auckland. Changes like these, and the sale of green spaces increasingly beg the question: who is Auckland for? Because increasingly amenities that Aucklanders take as their birth-right - access to green spaces, the right to a night out in the city, freedom to swim close to home - are under threat, because the city is being re-oriented, repainted, represented as an investment opportunity for a few, rather than as a place to live and to thrive for the majority. The slogan, "the world's most liveable city" is becoming ironic. At least with the "city of sails" you can, on a good day, count the sails out in the Harbour. Maybe there are other ways to measure what is happening, beyond a planned increase in metro GDP which closely correlates in any case with an increase in population, so that our indicators draw attention to what matters to those who live in Auckland already. Other cities (in Sweden, Germany, Japan) have around zero population growth and focus on measuring the quality of life/person, and wealth/person. Not for those cities anymore the crude emphasis on growth at any cost. International interest in measuring quality of urban life is growing. Numbeo is gaining traction because of the sheer volume of data it can draw upon. Have a look at its quality of life rankings and what it considers important when measuring quality of life. And this is an interesting account of what is happening in Japan (a no growth economy), which concludes: "Japan’s experience seems to tell us that the end of growth does not mean the end of everything. Even without growth, Japan seems to have a better handle on many of life’s pressing problems, including health care, longevity, public safety, and personal security than does the faster-growing and wealthier US economy...."
This statistic about "influence" is not a surprise either. Because the main influence on Auckland Council is the legislative framework that binds it into Central Government's growth agenda, coupled with the efforts of politicians and officers who also subscribe to that agenda. I think it is time to challenge that agenda. 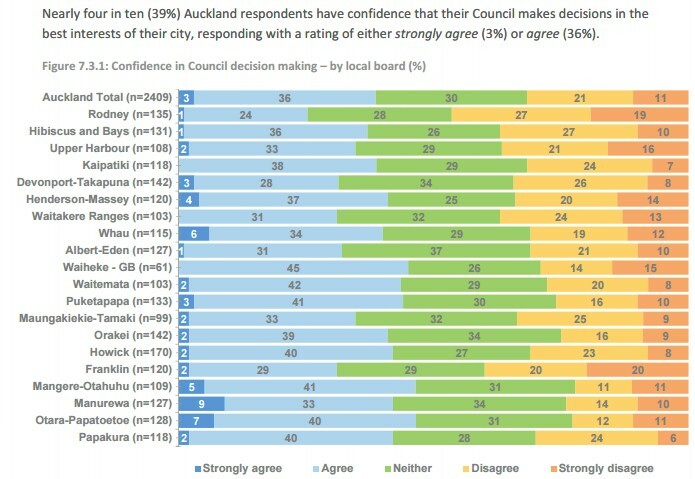 Is it the best we can do in Auckland, and for Aucklanders? In the meantime, the most effective way for officers and politicians and activists to challenge this agenda when considering a decision, initiative or proposal, is to raise questions about who loses and who gains from it. This is not an anti-development tactic. It is a way of ensuring that the public interests held by existing residents and communities are given proper weight when making decisions that will affect their qualities of life. These interests cannot be left to market forces. Today's Herald kicked off a 10 part series on what needs to happen in Auckland. This will come from a variety of perspectives, so we won't all agree with everything. As my father used to say, wisely, you can please some of the people all of the time, you can please most of the people some of the time, but you can't please all of the people all of the time. I was surprised to see a view given prominence today, that Auckland should aspire to/learn from Houston, Texas. This is a city of almost 7 million situated in topography that is very different from Auckland. And that's the start. I'm enough of a planner to know that it is risky to make statements about a city without having lived in it for decades, just as it is difficult and risky to compare cities. But one thing I have been taught is that most of the designs and thinking that went into Auckland - after the Second World War, and after we got rid of the trams - was driven and influenced by the American Dream. 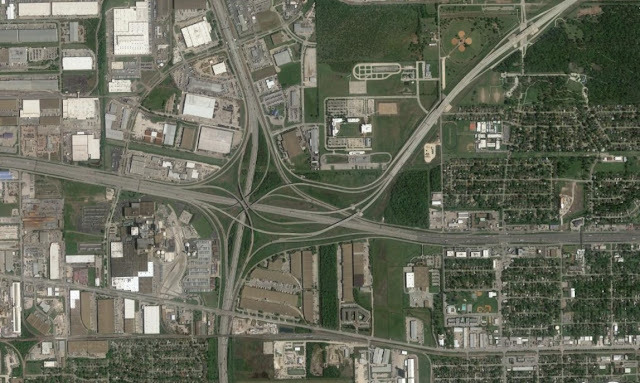 If you look at this picture of Houston with your eyes a little bit squinted you can easily see Auckland's Spaghetti Junction of motorways wrapped round and feeding into the CBD, and severing the rest of the city from it. 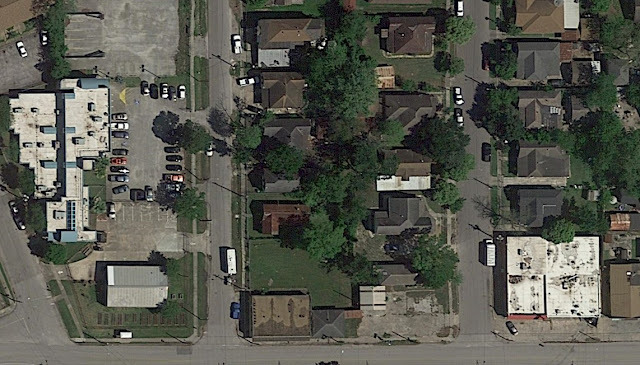 And here is a Houston equivalent of Sylvia Park. Praised in some planning quarters, but dominated by a motorway and free of good quality green open spaces and parks. Yes - the people live in nice green tree lined properties with stand-alone houses - but not a lot of medium density here. And don't try and take my local amenity away from me. Easier to take my gun! And here's more of a close-up. I had to look a little harder for this. 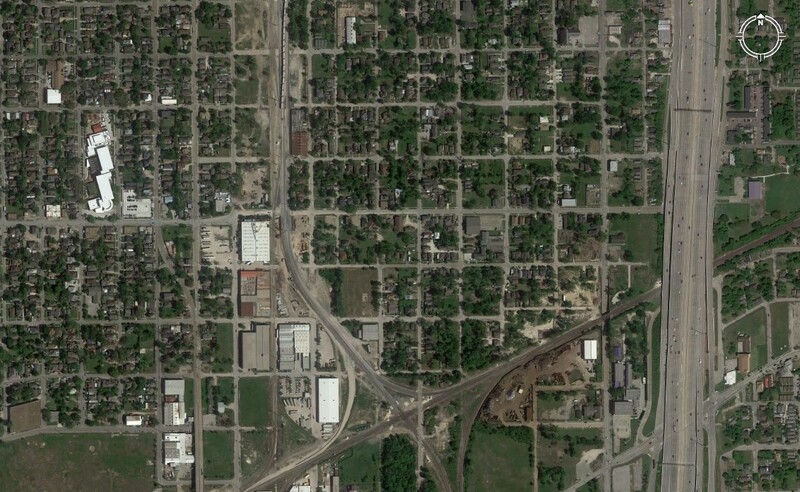 Trying to find a bit of mixed use in walking distance of residential streets. But again there is the empty provision of car-parking. Houston is one of the most car-oriented cities in the USA. Why would we want to hold it up as an example for Auckland - other than to justify growing Auckland outward to house 5 million plus citizens. 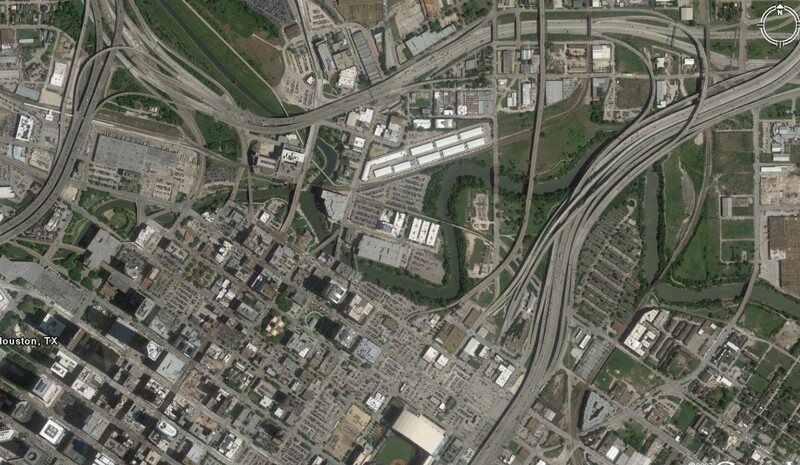 I think, if we want to look to Texas for a model, then I'd choose Austin Texas any day, over Houston. It is similar in scale to Auckland and it offers the most live music venues in the USA - I understand. This is what makes Austin liveable - it houses and parades its diversity and culture. .... the Council was required to follow the processes and procedures laid down by the Local Government Act. That statute was fully effective from 1 July 2003. Those procedures were put in place "to provide for democratic and effective local government that recognises the diversity of the particular community". They were intended to provide a framework for analysis to facilitate good decision-making by local authorities, in the interests of its constituents. Those procedures must be read in conjunction with the Local Government Act's more general statements about the purpose of local government. One of the purposes is to promote efficient and effective performance of decision-making tasks, in a manner appropriate to present and anticipated future circumstances. The Local Government Act contemplates a local authority's business being conducted "in an open, transparent, and democratically accountable manner". That is consistent with accepted notions of public accountability to those whom the elected Mayor and Councillors represent. The Council is required to "make itself aware of" and "have regard to, the views of all of its communities". It must also have regard to the interests of future, as well as existing communities. It is common ground that the nature of the decision to build the sewage treatment plant required the Council to follow the "special consultative procedure", to which s 83 of the Local Government Act refers. That procedure was invoked because payment for the project had to be achieved over a number of rating years. That meant that the development of the project had to be part of a long-term plan, as defined. (a) Prepare a statement of proposal to identify what it is that the Council wants to do, and put that on the agenda for a meeting of the Council. (b) Make the statement of proposal available for public inspection at places to which residents and ratepayers are likely to have reasonable access. (c) Give public notice of the proposal and the consultation being undertaken by the Council.50 The public notice must state how persons interested in the proposal can obtain a summary of information about it, and inspect the full proposal. (d) Include in the public notice a statement of the time within which public submissions may be made to the Council and ensure that any person who makes a submission has a reasonable opportunity to be heard by the Council, if the submitter so requests. (e) Generally, ensure that every meeting at which submissions are heard or the Council deliberates on the proposal are open to the public. 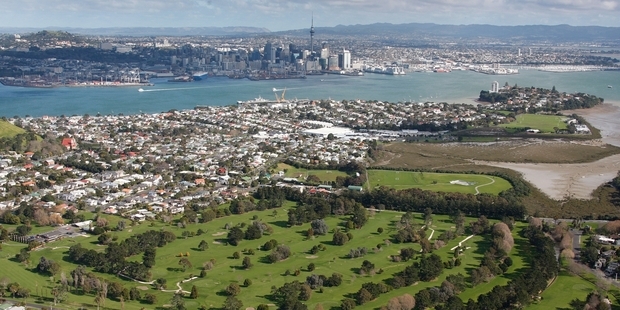 Given the sums of money involved and the location of Downtown Auckland, it is not unreasonable to treat Auckland Council plans for the redevelopment of this area as a "proposal" and argue that it should follow the "special consultative procedure" to comply with Local Government Act purpose and principles summarised in this judgement. But that hasn't happened. It is common knowledge that the Downtown redevelopment project has not followed this process and it is among the reasons for the growing public concern. In recent weeks various procedural steps that do require public notification and participation have been forced on Council and Precinct Properties. The first is Plan Change 79 which aims to change the planning controls and provisions over Queen Elizabeth Square - essentially to stop it being public space and enabling it for private development and also allowing it to be shaded by the tower that is proposed next to it. The second is the need for a "Road Stop" process on Queen Elizabeth Square which then allows it be sold privately. Submissions to these processes ended respectively on or about 13th July 2015 and 28th July 2015. This posting quotes some of those submissions. Submissions in opposition have come from Auckland Architects Association Inc (AAA); Urban Auckland Inc (UA); Auckland Branch of New Zealand Institute of Architects; the Auckland Urban Design Forum, and Walking Streets Aotearoa Inc.
9. AAA involves itself from time to time in the planning of downtown Auckland in pursuit of architectural excellence and the production and protection of great pieces of city. AAA’s experience in regard to QESQ is not recorded in the background provided in the s.32 analysis supporting the Plan Change which does not cover the planning period which gave Auckland the HSBC Tower and led to design outcomes which have contributed to Queen Elizabeth Square’s poor performance as a civic square. This early history, which also includes an account of AAA’s involvement at the time, can be read at: A Short History of Downtown Auckland (Published in Architecture NZ). This account describes Auckland Harbour Board’s focus on a level of development density that would not support the public space provision envisaged by urban planners of the day, and which led to the construction in 1973 of what was then known as the Air New Zealand Tower, despite submissions by the Auckland Branch of the Institute for Architects, and AAA submissions about shading and a wind tunnel model demonstrating the predictable winds that would arise on Queen Elizabeth Square. 10. Little changed until the past decade when Westfields – the owner of much of the site before Precinct Properties – sought non-notified consent for a 41 storey tower at the corner of Lower Albert and Custom Street West which was granted in 2008. Restrictions were tight because of the Harbour Edge Height Control Plane. The proposed tower exceeded the height control by some twenty metres, but such a penetration was permitted by the District Plan provided equivalent open space was provided. The non-notified processing of this consent by Auckland City Council at the time meant there were no public submissions, or public awareness of this project. It was also a factor in Auckland Regional Transport Authority being largely ignored despite its need to protect the Central Rail Link route before any potential tower foundations took planning precedence. 11. That five year resource consent was renewed before expiry in 2013 by Auckland Council in April 2011, again on a non-notified basis. Shortly thereafter Precinct Properties purchased Westfield’s interests in the downtown site and negotiations between Council and Precinct Properties proceeded in relation to the CRL project and Precinct Properties plans to redevelop the site. AAA notes that until now, despite numerous newspaper reports and conjecture about what might happen, there has been no opportunity for public submissions regarding redevelopment proposals for the downtown precinct. 12. The supporting s.32 for the Plan Change provides an account of the Downtown Framework (“Framework”) which was released in September 2014. 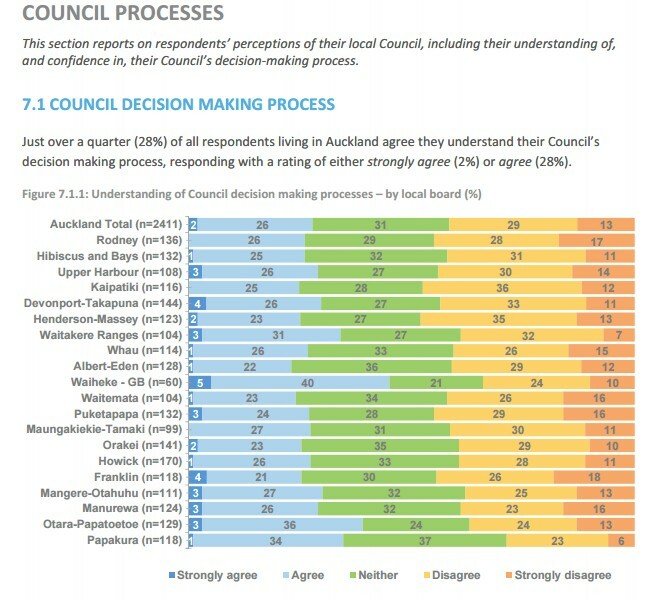 Council’s website describes it: “Led by Auckland Council's City Centre Integration Team it brings the City Centre Masterplan, Waterfront Plan, Regional Land Transport Programme, Economic Development Strategy and Auckland Unitary Plan to life.” In AAA’s view the Framework is vulnerable to criticism in that its purpose is primarily to enable CRL enabling works, to facilitate Downtown development, and to justify the sale of QE Square land – without providing any certainty as to commensurate replacement public space, or how dislocated public transport interchange facilities would be provided. The Framework text, direction and themes all prioritise CRL enabling works and downtown development. 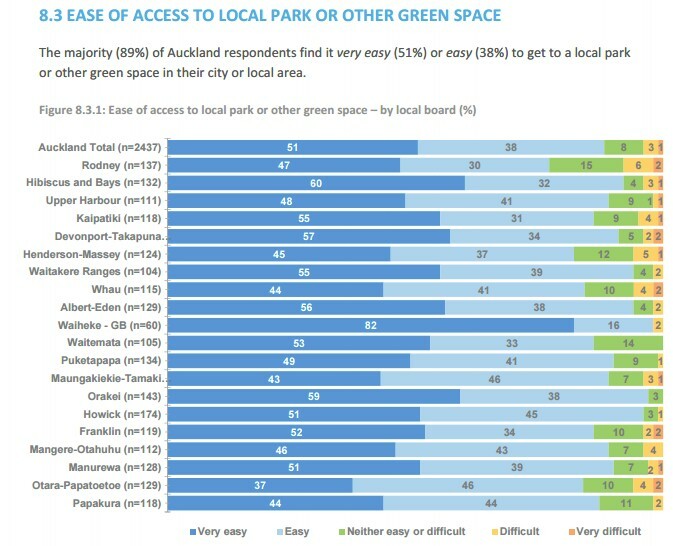 Public spaces, parks and squares are mentioned but not taken seriously, despite the advice given by Reset Urban Design in its assessment of public space in central Auckland. No public submissions have been sought by Council in regard to the Downtown Framework. 13. Despite the significance of public space as an issue in downtown Auckland, and the public controversy there has been over the proposed sale of QESQ, the present Plan Change is the first opportunity to make submissions on its future. 16. AAA notes that the Plan Change in part responds to Auckland Council decisions that when QESQ is developed then the eastern edge of Lower Queen Street should be built to a minimum height with verandahs and suchlike, and that the shade controls that presently protect QESQ shall be removed thus permitting the shading that is likely to be cast from the tower proposed at the corner of Lower Albert and Custom Street West. However AAA finds itself unable to respond meaningfully to these proposals because they are essentially presented in a vacuum. For example, no information is provided about how Lower Queen Street will be used by public transport or by other modes of transport which will affect the way pedestrians interact with buildings on either side of Lower Queen Street, and how the public space that is left will be used. AAA submits that meaningful submissions could be prepared should a Precinct wide plan change be promulgated and notified which would allow an integrated assessment and consideration of effects and outcomes. 17. AAA understands that a sum of some $27.2 million is projected from the sale of QESQ, which will be available to reinvest in public space, though the options that have been canvassed are all already in public ownership (sections of Queens Wharf, Port of Auckland Admiralty Steps, sections of Quay Street or/and Lower Albert Street). AAA submits that more appropriate options for providing downtown public space exist - given that the whole of downtown west area is to be redeveloped. A more successful public space than the present QESQ could be provided within the existing downtown west footprint. It could, for example, front onto Lower Albert Street. Or it could front onto the corner of Lower Albert and Quay Streets. Such locations would be away from the shading effects of both 1 Queen Street and the proposed tower, and would benefit from and be of benefit to the kinds of activated frontages that could be built as part of the redevelopment. These alternatives should be considered as part of this downtown Auckland redevelopment. They are the kinds of alternatives that AAA would expect to see canvassed in a framework plan or structure plan that should be produced within or as part of a Precinct wide plan change. 18. AAA submits that significant adverse effects of allowing and proceeding with the Plan Change that is under consideration now include: that integrated planning for the area will be impeded; that integrated consideration of transport effects and land uses will be avoided; and that giving effect to the RMA in regard to the provision of scarce public space will impossible. 19. AAA considers that the present approach is reminiscent of Ports of Auckland’s failed attempt to expand Bledisloe Wharf where public access to Captain Cook Wharf was suggested in exchange. Here the possibility of some yet to be identified public space (nothing remotely similar in character to QESQ has been mentioned) is being offered in exchange for the loss of QESQ. 30. Planning Overlay Map 1 shows the Precincts and Quarters that are provided for in the District Plan. As mentioned these include: Quay Park, Britomart, Viaduct Harbour, Wynyard Quarter. AAA submits that the areas of Central Auckland where problems currently exist in terms of defining public spaces and protecting them for public purposes share one thing in common: they have not been protected by plan changes that have established those areas as Precincts or Quarters. Places with public space problems are: Princes Wharf (public space provision is poor and ambiguous), Queens Wharf (public space provision is frequently challenged by transport, parking and cruise ship operations) and Downtown (the present emphasis on private development and public transport services is at the expense of public space). AAA submits that the District Plan provides the rationale for the promulgation of a Downtown Precinct wide Plan Change in order to satisfy the Central Area policies contained in the District Plan and to deliver the RMA objectives, whereas the proposed Plan Change does not. 37. AAA does not support the Plan Change in its present form for the reasons set out in these submissions. 38. AAA would welcome a Precinct wide plan change for the downtown west precinct that would include provisions set out in the Plan Change that is the subject of these submissions. This Precinct wide plan change should include provisions relating to transport planning, particularly provisions for bus stops and bus interchange services. It should also incorporate commensurate public space provision that replaces any of QESQ that is lost consistent with the statutory planning framework that relates to central Auckland generally and to downtown west in particular. 1. AAA objects to the Queen Elizabeth Square Road Stop proposal that has been notified by Auckland Transport (“AT”). This objection is primarily because the loss of scarce CBD public open space that would be the outcome of this proposal is not compensated for by the contemporaneous or certain future provision of commensurate or better equivalent public open space in the area, despite this resource issue being identified in relevant District Planning documents, and despite relevant District Plan objectives and policies which protect CBD public space. 4. AAA understands that the land that is the subject of the Road Stop Notice (QESQ), is part of a substantial redevelopment under the control of Precinct Properties of an area of downtown Auckland that is bounded by Lower Queen Street, Quay Street, Lower Albert Street and Custom Street, and which is located at ground level above a section of the planned Central Rail Link (CRL) project. 5. While AAA supports the CRL project and could support the level of development of QESQ that is envisaged by the Plan Change, AAA’s support is conditional upon the provision of commensurate public space, and the protection of public spaces and streetscapes from effects arising from the provision of bus and other public transport infrastructure in the area after the planned removal of the Lower Queen Street bus terminal and the planned introduction of at-grade light rail infrastructure on Lower Queen Street. 13. In June 2014 Reset Urban Design were commissioned by Auckland Council to undertake an independent evaluation of current and future public space provision in the downtown area of Auckland City Centre. The work was commissioned as a consequence of an in principle decision by Auckland Council’s Auckland Development Committee to dispose of Queen Elizabeth Square. AAA has read this report and notes the following extracts which are relevant to this objection. 15. In describing the transformation of this area of Auckland from Port use to civic and other uses, during the period 1909 to 1974, ROSE finds: “Beginning of twentieth century huge changes with mechanisation and consolidation of Port; Public excluded for safety and security reasons, red fence constructed; Several key public buildings built reinforced the civic nature of the precinct..” (Pg 7). One of the key buildings was the CPO – now the Britomart Station. 16. In describing the Downtown Context and opportunity for change in the vicinity, ROSE notes and advises: “Currently in the downtown area there is massive amount of comprehensive redevelopment; Nothing specifically considered for Queen Elizabeth Square which is in the centre of the downtown area? ; Strategic relationships and fit should be a major focus for best joined up outcomes… (Pg 22). AAA strongly supports this advice. 17. ROSE makes international comparisons in its considerations of open space and urban fabric, and states: “High quality open space is a critical part of a successful urban fabric; Auckland’s fabric is strongly structured along the Queen Street axis which runs out to the Waitemata; Historically the spine/axis is anchored by civic open space both ends; The picture of open space currently is not one of a strongly coherent element; Huge potential for more varied, greater volume and more coherence and connectivity; Since 2000 there has been more open space added e.g. Wynyard Quarter and Britomart; More to come in areas such as Queens Wharf” (Pg 23, 24). 18. AAA notes that ROSE recommends the divestment of QESC, and that loss be largely compensated for through transforming Lower Queen Street into a high quality public gathering space with any development on QESC not exceeding three stories. AAA notes that the Road Stop proposal as presently drafted only makes references to internal rights of way, and makes no reference to the future treatment of Lower Queen Street. 19. AAA has conducted research into the appropriate processes and considerations for Road Stop procedures in urban New Zealand. It is clear from various contested Road Stop notices in other parts of New Zealand that pedestrian users of pieces of public land that are formally zoned “road” have a significant interest in what happens to such pieces of land, and that their views carry weight in the Road Stop process. A good example of this is the process that is reported to Wellington City Council’s (“WCC”) Regulatory Process Committee (5 December 2013) and which is entitled: “Proposed Road Stopping / Land Exchange – 47 Manners Street”. The purpose of the report was to seek approval from Council for the stopping of a section of unformed legal road in Victoria Street, and in exchange acquiring two parcels of land to facilitate the Lombard Lane Upgrade project which includes the extension of another public space. In this case a private developer that wanted to construct a commercial building with food court, ‘high street’ and ‘boutique’ retail tenancies sought a piece of open space land ‘comprising park benches, low planters with trees’. The two areas to be purchased in the swap are described as ‘dark blue area currently occupied by single storey commercial building… while the light blue area is a sealed car parking and storage area…’. 21. AAA notes that WCC treated this sensitive urban public space matter essentially as a land swap. The pieces of land bought and sold are within the same city block and satisfy criteria of being commensurate. Applying this approach to Downtown Auckland is what is required, AAA considers, so that QESC is essentially swapped for commensurate public space provided on the sunny and less windy side of the block and fronting onto Lower Albert Street or/and Quay Street. The current QESC Road Stop proposal falls short when considered against Wellington City’s approach to such matters – hence AAA’s objection to it. 39. AAA objects to the Road Stop notice in its present form for the reasons set out in these submissions. 40. AAA would welcome a Precinct wide plan change for the downtown west precinct that would be accompanied by an appropriate QESC Road Stop notice which properly compensated for the loss of that public space. This should incorporate commensurate public space provision that replaces any of QESQ that is lost consistent with the statutory planning framework that relates to central Auckland generally and to downtown west in particular. Any Precinct wide plan change should include provisions relating to transport planning, particularly provisions for bus stops and bus interchange services that will affect pedestrian amenity in surrounding streets and public spaces. 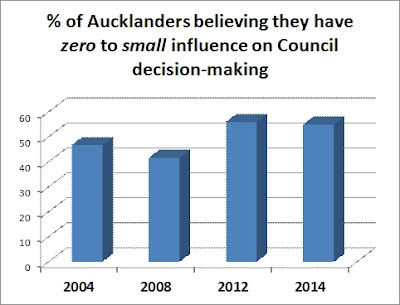 Auckland Council and Auckland Transport have driven Auckland public interest agencies into a corner because public space and amenity outcomes have been largely disregarded in the regeneration planning for Downtown Auckland. This is not just a story about notification - or the lack of it. Nor is it a story about consultation - or the lack of it. 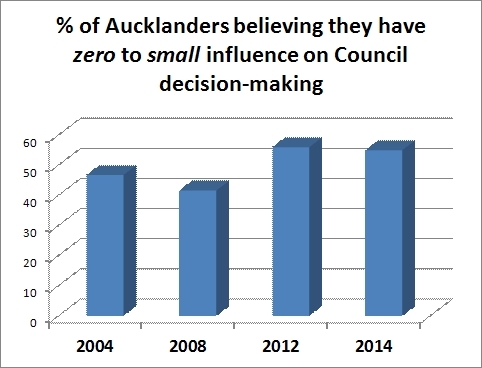 It is fundamentally about the failure of Council to provide sufficient safe and high quality public spaces and places in the heart of downtown Auckland. Reflection: During my time at the ARC, legislation created Auckland Regional Holdings (ARH) and Auckland Regional Transport Agency (ARTA). This happened in 2004 - the year I was elected onto ARC. My responsibilities were in the transport space. An interesting thing happened. Senior staff of ARH decided that the Pitt Street offices of the ARC weren't salubrious enough, and so they took themselves off and found designer office space on the waterfront. Us minions didn't get to know about it for a while, but I remember Chairman Mike Lee took up the cudgel as only he can, and after a few months we got them back in house. ARH was in charge of about a billion dollars worth of public assets, including a load of cash, and Ports of Auckland Ltd. The feeling was that this treasury arm of Council needed to be close its governing body, accountable for its actions, and not too independent. Another experience came with Watercare. I was on the Shareholder Representative Group (SRG) for a few years. It came to our attention that the management team of Watercare decided to set up office in superior offices the ASB building. Maybe to be close to investors at a time when privatisation was to the fore. Top consultancy Halcrow came out from UK and did an audit of Watercare to advise the SRG on ways Watercare could become more efficient. One of those recommendations was that Watercare didn't need city based top end HQ offices. Eventually they moved back to Newmarket. End of that reflection. Highly visible development projects in the area of Downtown Auckland bounded by Quay Street, Lower Queen Street, Custom Street West, and Lower Albert include the underground CRL enabling works (tunnelling - and obviously all underground) and the proposed Precinct Tower at the corner of Lower Albert and Custom Street West. Public concern has been expressed about the potential loss of downtown public space that would be associated with Queen Elizabeth Square being sold for private development, without commensurate public space being provided in public compensation. Reflection: I was Deputy Chair and then Deputy Chair of North Shore City Council's (NSCC) Works and Environment Ctte. Half of its agenda and responsibilities related to transport and transport infrastructure. Interestingly, in my time, and without naming names, two of the key characters with high level responsibilities relating to City Centre Integration and Development were General Managers in charge of transport at NSCC. So I got to know their modis operandi pretty well. I hasten to add that it wasn't particular to them. It appears that Auckland's local road and transport behaviours are much the same across the region. What I learned over those years, and the years that have followed, is that local transport planning generally goes below the public radar. I learned that a key reason for this was to maintain flexibility in transport project planning and in budgeting. You could see this as an excuse for sloppy management, but in fact - if you can persuade the powers that be - it is a highly rational strategy. It gives the transport department freedom to do pretty much anything it wants, whenever it wants - and avoid robust political or public accountability. Interestingly, I found that District Plan provisions relating to the management of adverse effects from transport projects, are almost entirely non-existent. "We need flexibility. We can't be notifying what we want to do every five minutes...", was the refrain. In the old colonial days this might have been appropriate behaviour. But today - when regenerating a central area of the city - engine room or not - this sort of behaviour is not acceptable and it is very much against the purpose and principles of the Local Government Act. End of that Reflection. The redevelopment of Downtown West presents enormous development opportunities. It also presents opportunities to create a piece of city with remarkable public spaces and places. But those opportunities inevitably conflict with private development opportunities and desires, and they also conflict with the need to provide for transport needs. It is unhelpful to wish these conflicts away with wishful "integration" thinking, and by minimising public engagement and putting all hopes and trust in the hands of a few urban design professionals unable to put hand on heart and say they agree what "good urban design" actually is. Because there is no such thing. There might be a process. 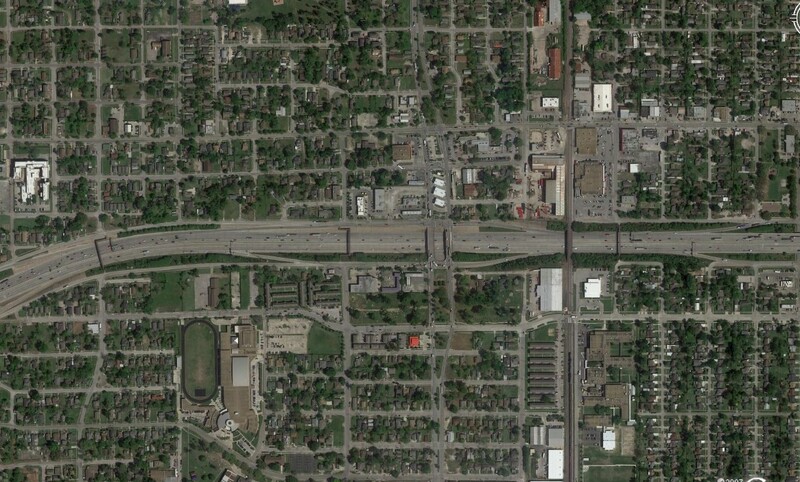 However, in every urban regeneration project someone loses, and someone gains. These gains and loses are measurable - particularly loses in public space and pedestrian amenity - even if the goodness of urban design is not. It is because these gains and loses are measurable that it is dishonest to wish those issues away and hope for the best with an integration process reliant on deals being made between Council (Auckland Transport) and the private developer. Some may argue that this is a good example of a PPP - a Public Private Partnership. But unless the goals and ideals and objectives of unhindered and freely accessible and useable public spaces are fully integrated into the planning processes - this PPP has to be seen for what it is: a deal between a private investor and a publicly owned institution that has - so far - excluded wider public interests. Facts supporting this criticism are hard to find, because little has been public notified. Setting aside the CRL which is underground, and putting the poorly managed sale of QE Square aside as well, there are a number of transport infrastructures and activities that will have significant adverse effects. I understand that Precinct want a three lane wide entry and exit crossing into Lower Albert Street. Assuming the underground parking provision doubles on the site, both for private cars and for commercial vehicle movements, that footpath crossing will be dangerous. It will have the movements of a side street. The quid pro-quo for this, the deal between Precinct and Auckland Transport - we'll help you if you help us, lies in the detail of how Auckland Transport proposes to replace the bus interchange infrastructure that is presently located in Lower Queen Street. Vague drawings were shown in the Downtown Framework - but these were widely criticised as being inadequate and unspecfic (consistent with the need for "flexibility"). Where will all this infrastructure be placed? What will it do to Lower Albert Street? What will it do to the small streets within Britomart? And what will it do for the pedestrian amenity and endangered public spaces? Looks like the engine-room will be filled with engines. That's the sort of outcome that is the risk of a planning process that does not properly integrate and include public ideas, aspirations and interests, and which does not honestly do the calculus of who gains and who loses with the various options under consideration, and those which are not. Yet.